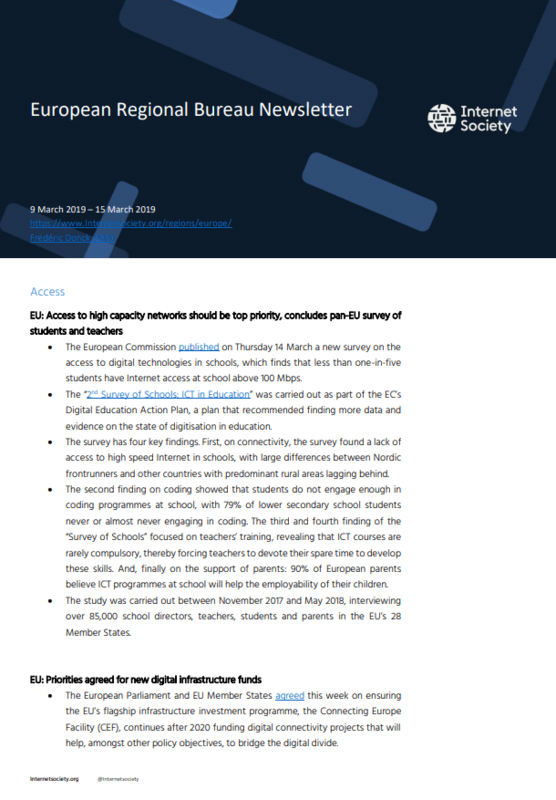 The European Commission published on Thursday 14 March a new survey on the access to digital technologies in schools, which finds that less than one-in-five students have Internet access at school above 100 Mbps. The “2nd Survey of Schools: ICT in Education” was carried out as part of the EC’s Digital Education Action Plan, a plan that recommended finding more data and evidence on the state of digitisation in education. The survey has four key findings. 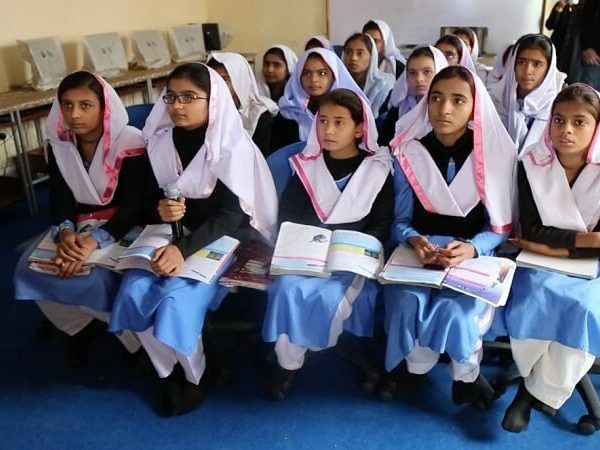 First, on connectivity, the survey found a lack of access to high speed Internet in schools, with large differences between Nordic frontrunners and other countries with predominant rural areas lagging behind. The second finding on coding showed that students do not engage enough in coding programmes at school, with 79% of lower secondary school students never or almost never engaging in coding. The third and fourth finding of the “Survey of Schools” focused on teachers’ training, revealing that ICT courses are rarely compulsory, thereby forcing teachers to devote their spare time to develop these skills. And, finally on the support of parents: 90% of European parents believe ICT programmes at school will help the employability of their children. The study was carried out between November 2017 and May 2018, interviewing over 85,000 school directors, teachers, students and parents in the EU’s 28 Member States. The European Parliament and EU Member States agreed this week on ensuring the EU’s flagship infrastructure investment programme, the Connecting Europe Facility (CEF), continues after 2020 funding digital connectivity projects that will help, amongst other policy objectives, to bridge the digital divide. In the area of digital connectivity, the programme now reflects the fact that the digital transformation of society depends on universal access to reliable and affordable high capacity networks. In order to be eligible for CEF funds, projects will need to contribute to the digital single market and EU connectivity targets. Furthermore, projects contributing contribute to additional area coverage for households will be given priority. The European Parliament’s plenary session approved this week the trilogue agreement on the proposal for a European Accessibility Act. The text aims at making several products and services in the EU more accessible for people with disabilities who represent upwards from 80 million people across the EU. The proposal includes requirements for products and services such as e-books, banking services, e-commerce and computers. It also includes common accessibility requirements on the user interface. The final text still needs to be approved by the Council before it can enter into force; once it has been published in the EU’s Official Journal, Member States will have three years to transpose the provisions into national law. After the fall-out from the Cambridge Analytica scandal and in its efforts to re-build the company’s reputation, Facebook has taken down hundreds of profiles and Instagram accounts linked to hate domestic groups in the UK and Romania. The groups carried out coordinated provocative behaviour to disseminate hate speech and subsequently spark debate on hot-button issues like emphasising differences between Islam and Christianity, the India-Pakistan conflict or immigration. “The actors were playing both sides and engaged in a series of divisive issues”, reported Nathaniel Gleicher, Facebook’s head of cybersecurity. According to Ben Nimmo, a senior fellow for Information Defence at the Atlantic Council’s Digital Forensic Research Lab, the groups were attempting to bait far-right supporters into a provocative debate with Muslims. In the Romanian case, local groups had created Facebook content portraying themselves as independent news, but instead were promoting partisan information linked to the Social Democratic Party. The European Parliament’s Culture Committee (CULT) adopted last Monday its opinion on the dissemination of terrorist content online with 17 votes in favour, 2 against and one abstention. The legislative proposal, issued by the European Commission in September 2018 and assigned to the Civil Liberties, Justice and Home Affairs Committee (LIBE), aims at introducing a ‘one-hour rule’ giving content providers an hour deadline to remove harmful content once the order has been given by the competent national authority. The text also includes a framework for reinforced cooperation between Member States, service providers and Europol. Disagreement between negotiators is expected on the one-hour rule as Daniel Dalton (ECR, UK), rapporteur for the text in the LIBE Committee, has proposed giving content providers more flexibility, with an 8-hour threshold, arguing that, with current technology, 1-hour was not technically feasible for platforms. The European Parliament is expected to vote on the final text during its last Plenary session on 16 April. The European Parliament ratified this week the political agreement reached between EU Member States in the Council and the European Parliament on the Cybersecurity Act. The text reinforces the mandate of the EU Cybersecurity Agency and establishes an EU framework for cybersecurity certification, two objectives that received broad support from MEPs across various political groups in recognition of the need to boost online security for European citizens in the advent of the Internet of Things. National ministers must now formally approve the text and the regulation will enter into force 20 days after it is published. According to a leaked version of France’s new hate speech law, the government will aim impose penalties on platforms like Facebook, YouTube, Vimeo, and Twitter if they fail to remove flagged hate speech flagged within 24 hours. The legislative proposal responds to the stated objective of French President Emmanuel Macron to increase the liability of online platforms in a bid to counter the surge of online hate speech. Penalties could reach up to four percent of the annual worldwide turnover of the company. France’s audio-visual regulator, the CSA (Conseil Supérieur de l’Audiovisuel) will be the authority in charge of enforcement of the regulation and will also publish reports on the actions taken by media platforms to fight hate speech. According to a group of senior British politicians, Facebook, Twitter and other social networks, should face sanctions from enforcement agencies if they do not keep track of what is published on their platforms. Based on the principle of “duty of care”, the UK House of Lords is drafting a report on regulating the digital world that argues Internet platforms should take ownership of what is published on their platforms. The enforcement of this duty, according to Stephen Gilbert, Chair of the Communications Committee of the House of Lords, and the person responsible for the review, the online law should be enforced by a new Office of Communications that would have the power to impose fines if social platforms do not remove hate speech, online bullying and other harmful content. The Internet Association – an industry trade group whose members include Google, Facebook, and Twitter, recognised more efforts are needed to stop harmful material being shared online. Margarita Robles, Spanish Minister of Defence, reported on Wednesday 13 March to Spain’s public prosecutor a potential intrusion into the Ministry’s internal networks, used for the day-to-day managing of the department’s activities. According to news reports, the hacker may have had access to the network some months ago, but the Ministry refuses to confirm the news. The cyber-defence command as well as the Spanish Centre for Systems and ICT are currently investigation the issue.